When we think about our sins, we often focus on the things we did or said that we shouldn’t have. 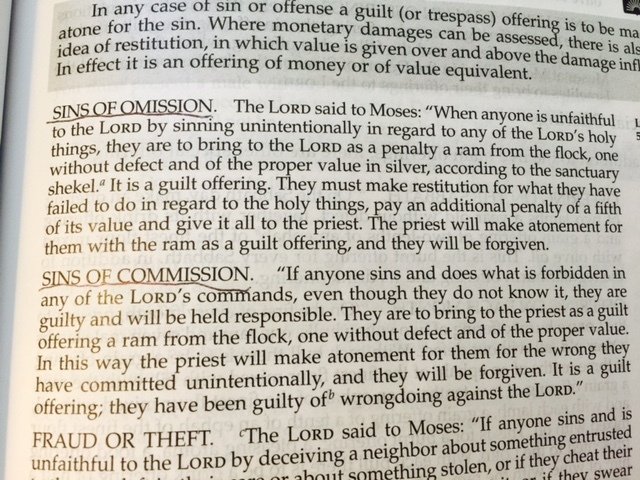 These are our sins of commission. * a word of encouragement to a leader at our church. * a pat on the back to a co-worker. * a special treat for a mother or father. * a smile to stranger. That last one reminds me of a recent Thursday morning when I was walking through a restaurant where my Bible Study small group meets bright and early at 6 am. As I walked past a man sitting at the eating counter by himself, he looked at me and I felt a nudge from God so I made eye contact, smiled and said, ‘hi’. Instead of greeting me back, he said, ‘Thank you”. I got the impression that he really needed someone in this restaurant crowded with groups of people to acknowledge his existence and smile. I’m really glad I didn’t miss that opportunity, that nudge from the Holy Spirit. I wish I could say that I was always listening and responding to those nudges, but if I said that, it would be a sin of commission 🙂 Because it’s not true. It was just a very small encounter at the start of a hectic day, but God has used it to remind me to be ready to respond to his nudges. Who else in my world is looking for a smile and a ‘hi’? Are there people in your world who need a smile and a ‘hi’? Or a word spoken? Or a door opened? Or a text sent? Or a card given? Dear Father, please open our eyes to the things we might fail to do without your nudge. We don’t want to miss the opportunity to be your light.